We’ve covered regular daily deal sites, those for small businesses, and even ones targeted at entrepreneurs. 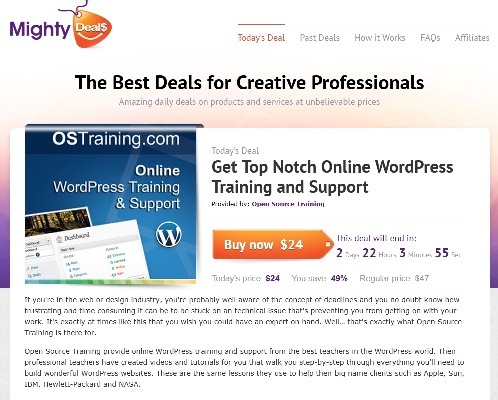 Here’s one that provides daily deals for creative design professionals – MightyDeals (www.MightyDeals.com). Started in November last year by popular blog for web designers and other creative professionals Webdesigner Depot, MightyDeals runs 24-hour specials on products and services such as applications, graphics, WordPress themes, templates and fonts, etc. where designers can find the best deals, as well as for businesses to reach new customers. Email alerts inform web designers and graphic designers whenever great deals become available.